Ya Jagoff!!! | The Wheels On The Bus Go........NOWHERE!!! Home Port Authority The Wheels On The Bus Go……..NOWHERE!!! What helps ya sit through Pittsburgh rush-hour traffic? Radio? iPod? Talking to your carpool buddies? Putting your make-up on or reading your Kindle while driving one-handed? Here’s what helps us – catching drivers being…. , well, YOU know!!!!! So we’re sitting there minding our own business waiting for the traffic light in front of us to turn green. As plain as day, we can see the City crew blocking the bus lane in front of us as they empty the garbage cans along the street. As plain as day, we can see the traffic light turn YELLOW for the crossing traffic. And, as plain as day, we see this bus pull accross the interesection AS THE LIGHT IS TURNING YELLOW !! Back to the matter at hand – so if Mr. Busdriver saw the garbage gang blocking his path, why would he even THINK he should pull his bus forward? Maybe he forgot and thought he was driving a Smart Car! Well, Mr. I-am-a-professional-driver-And-you-can-tell-because-I-wear-cool-black-leather-driving-gloves, not sure what they taught you in bus driving school but we’re prit-TEEEE sure that it didn’t involve blocking intersections during rush hour. Here’s OUR thought, maybe you’re moonlighting for the Super Lawyers, Rosen Louik and Perry (name on the side of the bus) and they give ya a tip for making people stare at the side of the bus through two full traffic lights evolutions. Now THERE’S a solution, maybe we’ll buy Ya Jagoff signsto put on the sides of all of the buses. 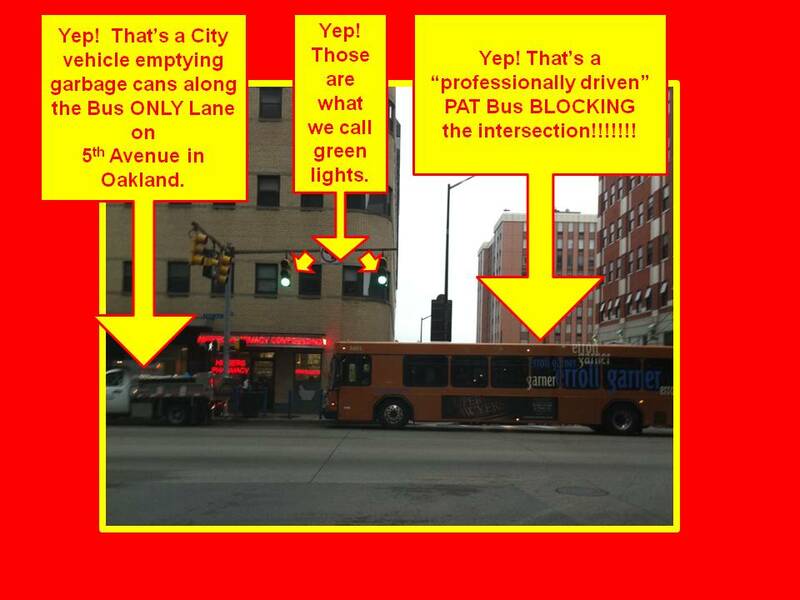 Then again, maybe not Mr. Intersection-blocker, because that would be like putting a NAME TAG on YOUR bus, Ya Jagoff!!! NOTE: Wouldn’t that be great to see our logo on the buses? Then you’d say to your friend, “Did you just see what that Jagoff bus did?” And then you’re friend would say, “Which one,?” Nobody would know if you were talking about the signs or the drivers!!!! Speaking of buses, don’t forget that every Saturday we know have a post on our blog from the Facebook page called, “Quotes on the Bus!” If you’re still on Facebook after this past week, go LIKE the page HERE! If you’re MAD at Facebook, feel free to right-click the sign below, save it and share it with your friends. Next articleHigh Octane, Um, I Mean…..Well, You Know….